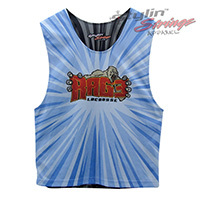 The Rage sublimated lacrosse shorts were designed to match the darker side of the reversible. We took the custom R from the Rage word mark and wrapped it with gorilla fingers on the front leg. We also split the side of the shorts so the gorilla could peak thru making this full short very unique.